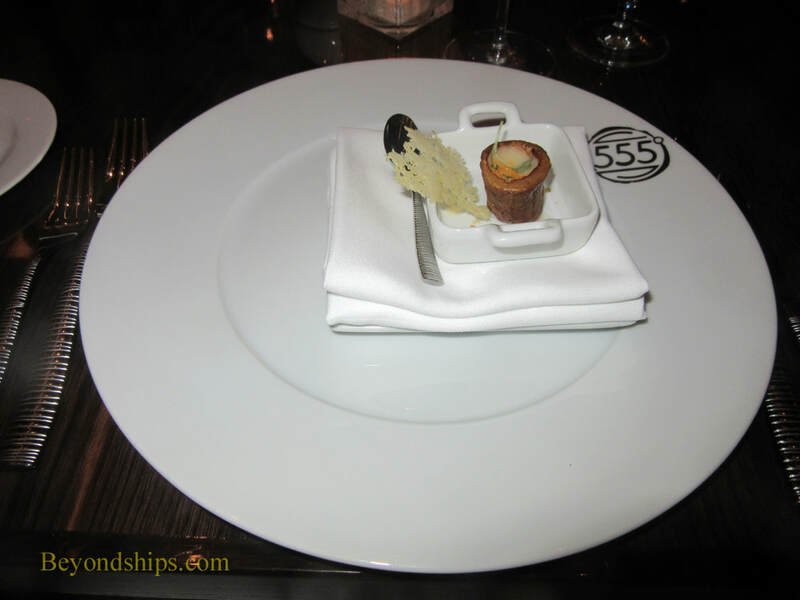 Farhenheit 555 is a classic American steakhouse. 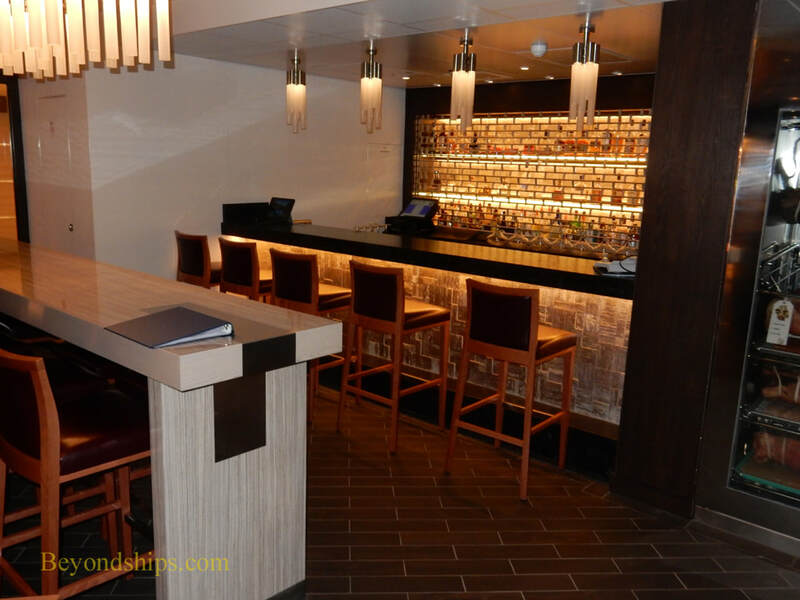 It is an upmarket steakhouse with contemporary uncluttered décor. The lights are kept low and live music drifts in from the adjacent piano bar. It has a sophisticated yet informal atmosphere. This steakhouse is a popular venue. Consequently, reservations, especially on a short cruise, can be hard to come by. Even though our reservation was early (6 p.m.), all of the tables were full, a few large groups but mostly couples. The guests were dressed informally. A few jackets were visible but no ties. Some of the women wore dresses but most were in slacks. While people were dressed casually, it was an elegant casual, no shorts, beachwear or ball caps. Service was friendly and efficient. However, with the restaurant full, the staff were rushing about. 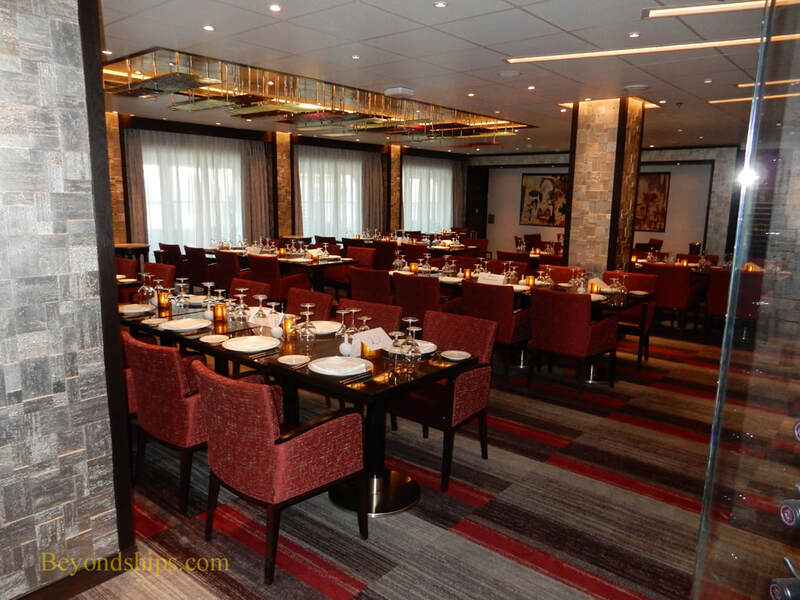 In contrast to the Fahrenheit 555 on Carnival Vista, where the various cuts of beef were presented before ordering, the guests here only had the descriptions on the menu to use in making their selections. While presenting the various cuts is not essential to the meal, it does make it feel more like a special occasion. It is part of the pampering. After placing the order, the meal began with an amuse boche, characterized by the waiter as a “gift from the chef.” It was a small potato with a cheese sauce in the center. Tasty but not exciting. 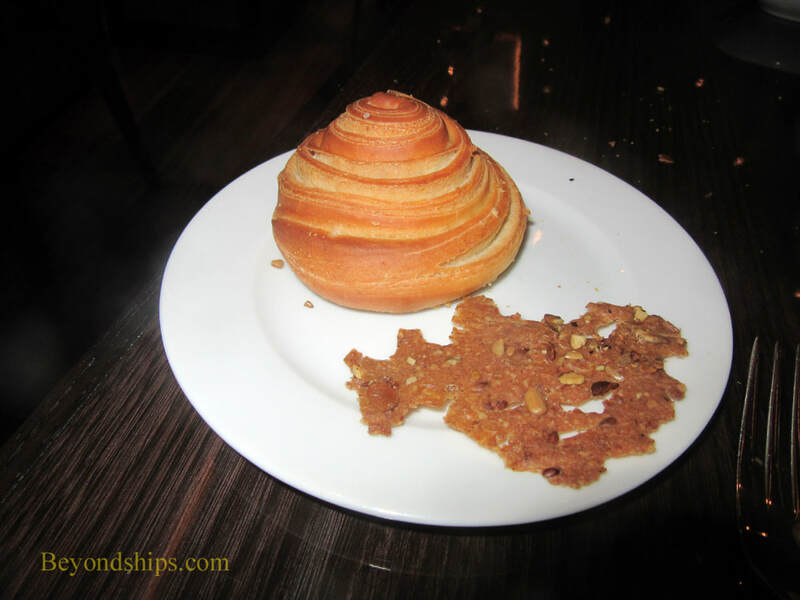 Guests are offered a choice of specialty breads. The options included an onion-based roll and a flatbread. Botth were tasty but the breads offered in the main dining rooms are superior. The basil and beet-root butter that comes with the bread, however, was excellent. 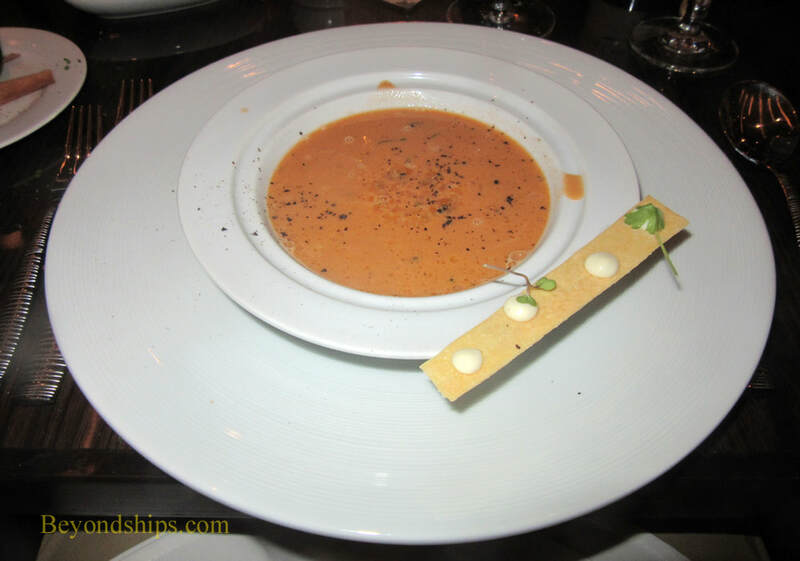 For the first course, we had lobster bisque. This is made from Maine lobster and has sherry and cultured butter. It had less cream than is typical with lobster bisque and as a result was not as heavy. 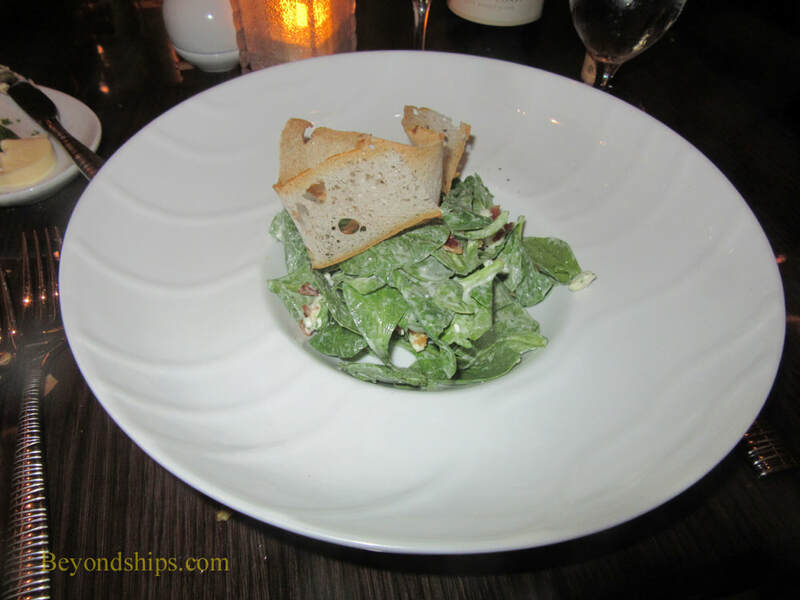 The spinach salad had a blue cheese dressing, mushrooms and bits of bacon As a result, there was a classic combination of flavors with the mushrooms providing sweetness and the bacon and blue cheese providing bite. Before the main course, a waiter came to the table with a box of different types of salt in an array of colors. He then asked us to select one of the types which would be used in preparing the main course. Following the waiter's recommendation, we selected Hawaiian salt, which he said was high in minerals. 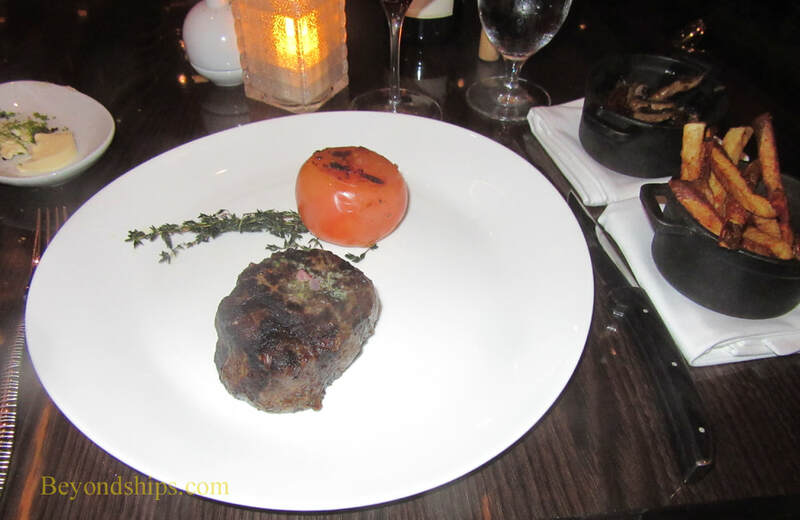 For the beef, we had a nine ounce filet mignon. High quality beef, cooked as ordered. Very good. To go with the beef, Fahrenheit 555 offers five different sauces. The waiter recommended the Bearnaise sauce, which is probably the most popular of the sauces typically offered at steakhouses. However, we asked to have samples of the red wine sauce and the three mustard sauce served on the side so that we could compare the two. Contrary to expectation, the mustard sauce was not very spicy and thus not that interesting. However, the red wine sauce was excellent adding flavor to the beef. The high-point of our meal at Fahrenheit 555 was the dessert. We ordered “Art at the Table.” To make this dessert, one of the chefs comes to the table with a large white board. He then uses various sauces and other ingredients to draw an abstract expressionist work of art on the board. He concluded by taking a large ball of white chocolate and breaking it open on the board. Inside is ice cream and various sauces. It is an excellent show and the end-product is quite tasty.